This is a family favourite of ours and is perfect for a comforting Sunday night dinner and can easily be doubled to cater for a larger group. It will work well with lamb shanks, lamb neck chops or any slow cooking cuts of beef. Slice the cheeks in half so you have 4 even pieces. Rub liberally with salt and pepper, then put in a container with the garlic, thyme and red wine. Cover and let the marinade do its thing in the fridge for 3‒24 hours. Preheat oven to 140°C and heat the oil in a large frying pan. Remove the meat and keep the marinade. Pat the cheeks dry with a paper towel. Brown the beef cheek in the frying pan then put into your casserole dish. Cook the onion in the meat juices until translucent then add the tomato concentrate and cook out for three minutes. Deglaze the pan with the balsamic and the marinade and bring to the boil. Pour into your casserole dish (make sure to use a rubber scraper to get every last drop of flavour from the pan). Add the raisins, beef stock and bay leaves. Cover the casserole dish and put in the oven for 4 hours. Turn the cheeks every hour. After 4 hours, uncover the cheeks and cook for a further 2 hours. Baste the cheeks regularly. You will know when it’s cooked as it will be super tender and almost falling apart. Remove from the oven, cover and let it rest while you prepare the polenta. Bring the chicken stock and milk to a soft boil in a large saucepan. Slowly pour in the polenta whisking vigorously to avoid lumps. When the polenta starts to spit (be careful it will be hot), lower the heat and allow the polenta to simmer until it starts to come away from the side of the saucepan. Frequently stir with a rubber spatula. After 20 minutes the polenta should be ready. Fold in the Parmesan and butter. 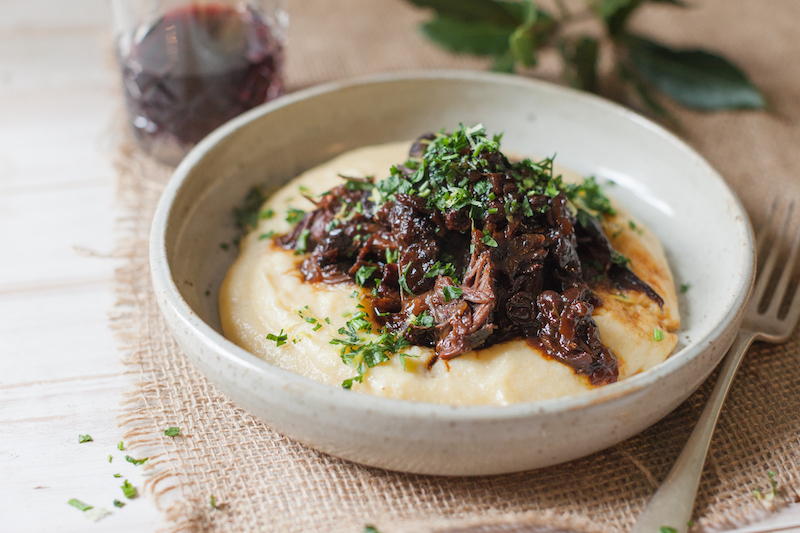 Serve the beef cheeks on top of the polenta with a little braising juice and sprinkle with the gremolata. Enjoy Justin’s dishes without having to do the preparation and washing up by enjoying a meal at Wallis Bistro in Raglan. Beef cheek can be hard to find. We got ours from The Greenlea Butcher Shop who deliver premium export quality beef and lamb to your door. In addition to beef cheek they sell other great winter cuts like Osso Bucco, brisket and meaty lamb shanks.